Quality ratings are based on consumer insights during the first 90 days of ownership. The following models ranked the highest for quality and represent the J.D. Power 2019 award winners for their particular segment. Dependability ratings are based on consumer insights after 3 years of ownership. The following 3-year old models rank the highest for dependability and represent the J.D. Power 2019 award winners for their particular segment. Performance and design ratings are based on consumer insights during the first 90 days of ownership. The following models ranked the highest for performance and represent the J.D. Power 2019 award winners for their particular segment. Award winners to be announced November 2019. 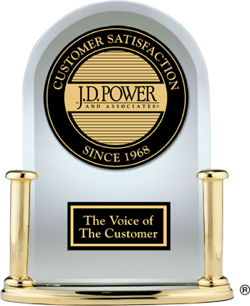 Dealership Service Experience ratings and awards are not available for 2019.